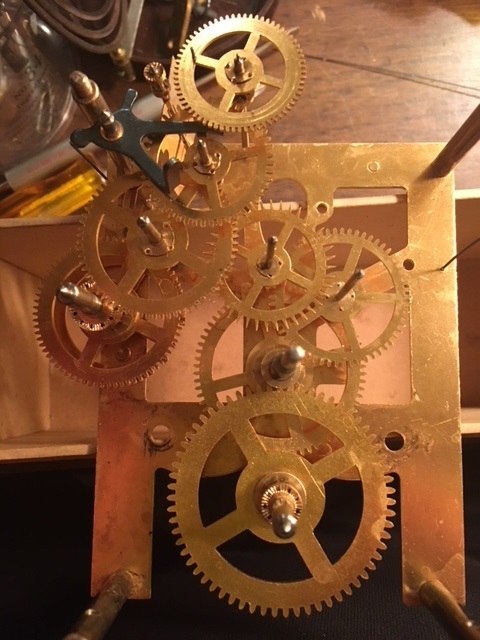 Once they are cleaned, it looked like a completely different clock. This picture shows the mainsprings already installed in the barrels. 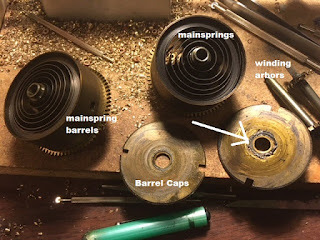 The barrel caps seal the mainsprings and the barrel arbors slip into the barrel sleeves and are used when winding the clock. this image shows the clock with the wheels placed but before the top plate has been placed. 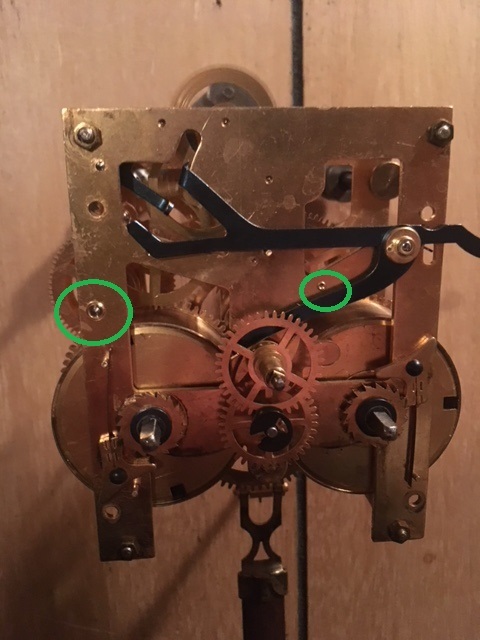 A big difference between the movement as it was brought into the shop and now. 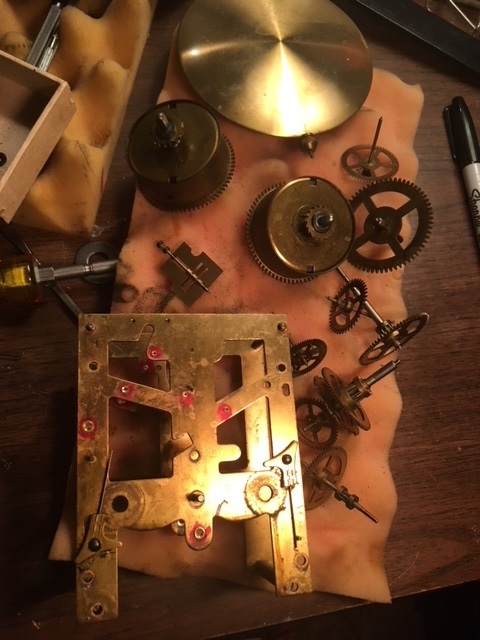 Here is the back of the movement after assembly. I've circled some of the pivot holes that were rebuilt. Here is a video showing the movement running on the wall. There were 14 pivot holes rebuilt. The pendulum ball was polished with brass cleaner. Has very good motion. 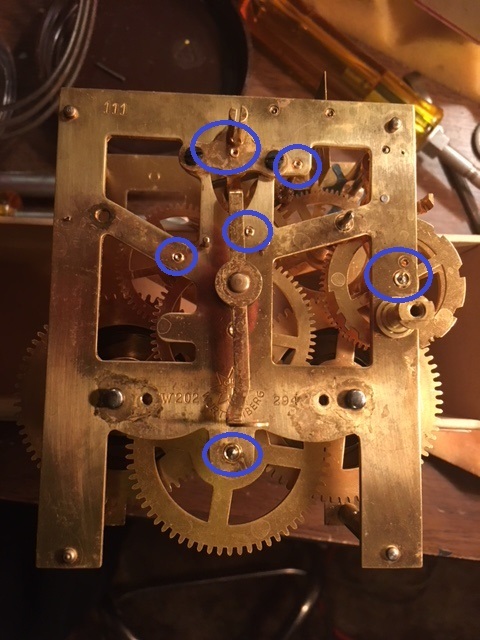 This clock appears to be a marriage with a Junghans movement and a pot shaped case. One reason is that there was not a good location for the chime gong setup. The gong was connected directly to the movement. The result here is that the gong has no place to resinate and if it did resinate would vibrate the movement to a point where it might cause the clock to stop. It does make a low volume sound which is probably acceptable. The hands when brought in for repair were loose. No hand washer and pin holding hands was not sufficient. This has also been repaired. Hands nice and secure. 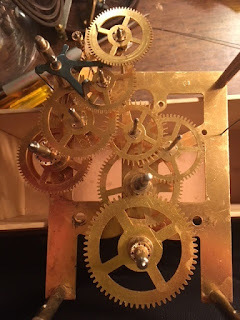 and follow this link for a short video of the clock running.